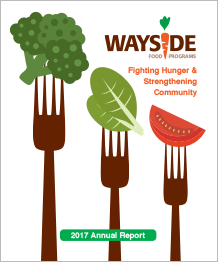 Through its Food Rescue Program, Wayside diverted 980,000 pounds of edible food from the waste stream in 2017. Rescued food was distributed to 55 partner agencies throughout Cumberland County including food pantries, soup kitchens, shelters, and other social service agencies. Our e-newsletter is your source for staying connected to Wayside. Keep up with the latest news, learn more about our innovative programs, and find out about opportunities to get involved. Sign up to receive Wayside news!